Pumpkin Patch Open in October FREE! If you're looking for pumpkins and other fall decor, there is no need to look any further. 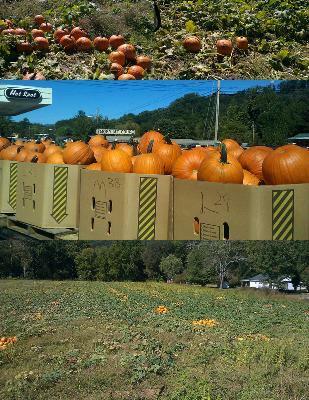 We have all sizes of Pumpkins, Specialty Gouards, Haybales, Cornstalks and Fall MUMS! Prices are quoted by the bin and are dependent upon availability. Count per bin may vary. Delivery Dates fill up quickly. We offer delivery services, and we know how important it is for you to receive your products on time! Call or email Terrie for quotes and delivery requests. Great Pics, fun time for the children! And it's FREE! Each child will get a free pumpkin to decorate!